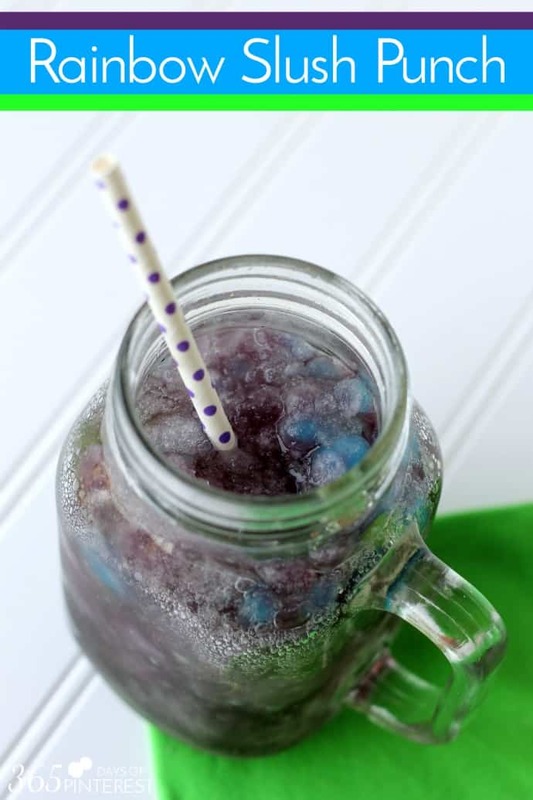 This Rainbow Slush Punch is perfect for St. Patrick’s Day parties or any cheery spring-themed occasion! Aaaaahhh, top o’ the mornin’ to you! St. Patrick’s Day is around the corner and that means my Pinterest feed is full of chocolate and mint desserts, rainbows and gold coins. I love all the rainbow recipes. I think a rainbow themed birthday party would be so fun! My boys aren’t exactly on board with me for that one, though. 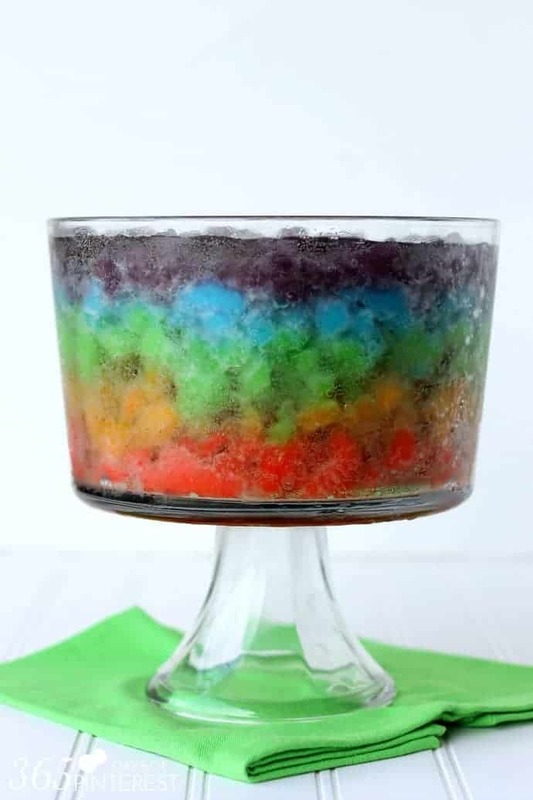 😉 I saw a rainbow themed party using rainbow slush and thought it was a cute idea. 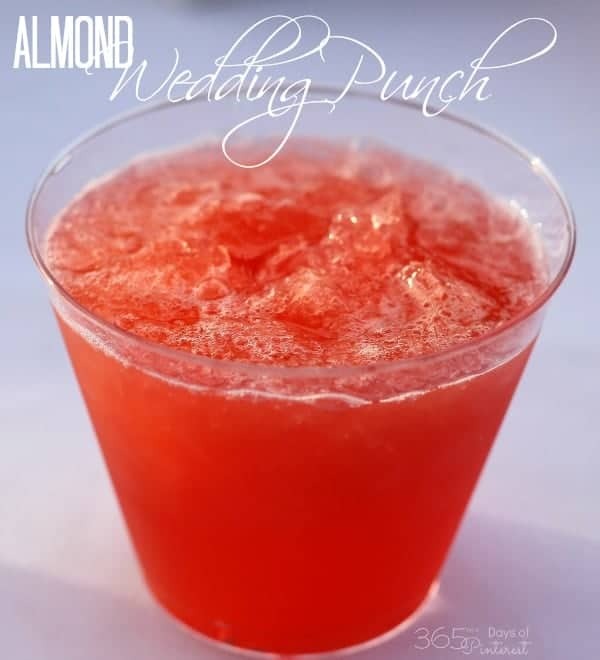 I decided to take that and make it into a punch, just for fun. 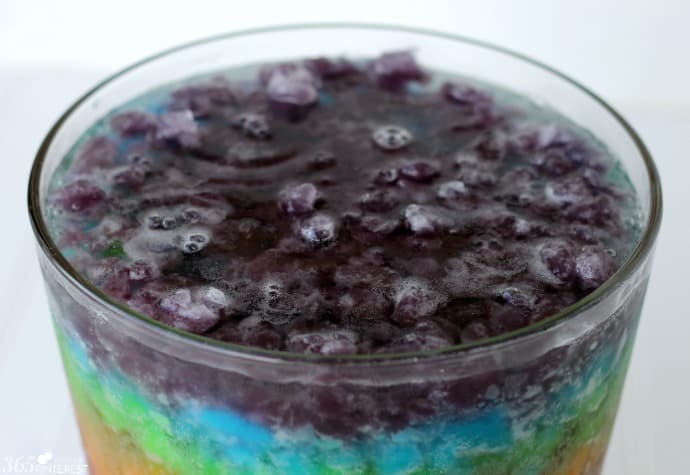 It’s so sunny and beautiful and I thought a rainbow slush punch would be a good way to welcome spring. 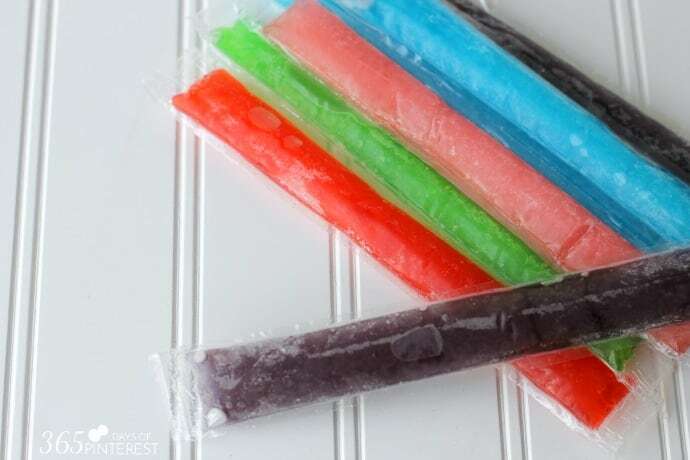 One word of caution: if you buy a box of 100 ice pops and leave them in the box in the freezer, it will take a LONG time for them to all freeze solid. So if you’re on a tight schedule, be sure to pull them out of the box and lay them flat on your freezer shelves. Once they are frozen, open one color at a time (about 10-20 of each color) and squeeze the contents into a quart sized baggie. Use one baggie for each color. Smash the ice pops into smaller pieces using a kitchen mallet or large spoon and then add to a bowl. Keep the bowl in the freezer between layers so the colors don’t start melting and run into each other too soon. 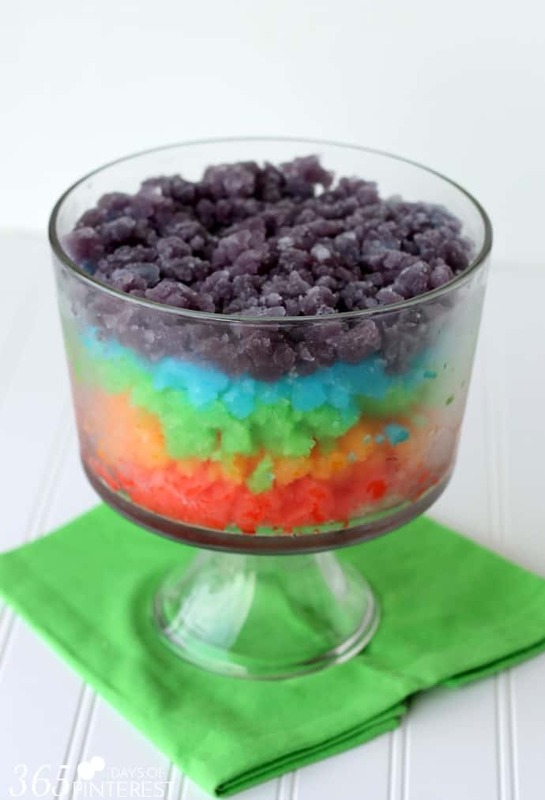 Layer your colors and leave the bowl in the freezer until 20-30 minutes before you’re ready to serve. 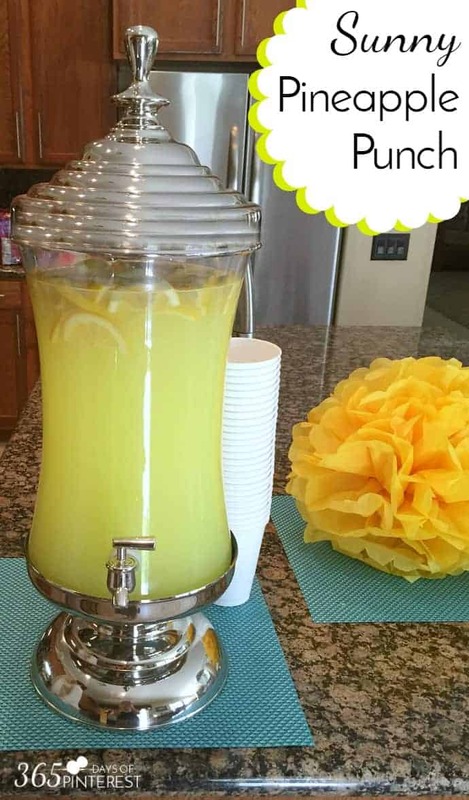 When it’s time for the punch, pour some lemon/lime soda over the ice pop layers to create a slushy punch. I used about half of a 2 liter of soda. You could easily use more to refill it as needed. Serve in a large bowl like this for a fun presentation. The more you dig around to scoop out the slush, the muddier your colors will get, so don’t expect it to stay pretty if you start stirring things around. 🙂 You could easily do this to match any party theme, too. Blue for a boy’s baby shower, pink for a girl, pink and purple for a My Little Pony party, green and purple for a Minecraft party…the possibilities are endless! 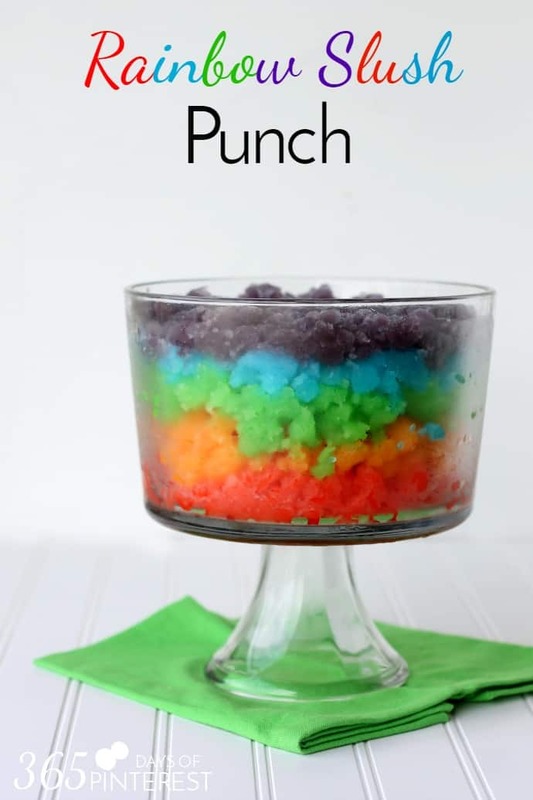 If you like this Rainbow Slush Punch, check out some of my other punch recipes!